Old Forge and the surrounding area offer so many different options for sports and recreation. 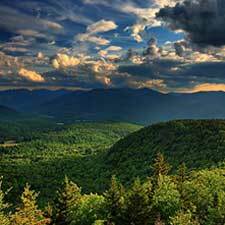 One of the greatest aspects of the Central Adirondack region is the natural beauty of the area. Every season of the year offers ever-changing opportunities to get out and experience the area. Many locally-owned shops also provide you with any equipment you might be lacking, plus knowledge of some of the best places to go. Whether you’re looking to snowshoe, ski, kayak, canoe, fish, swim, hike, or take in the breath-taking fall foliage, the Central Adirondacks is the perfect place for you! A.R.O. was the first New York outfitter on the Moose River and a founding members of the Hudson River Professional Outfitters Association. Horseback Riding – all ages welcome, no experience needed. Located just 8 miles north of Old Forge. Offering one hour rides and also 3½ , 4½, and 5½ hour rides to a scenic lake. It’s our pleasure to work with anyone in a therapeutic riding program, please just give us a heads up. Rondaxe Mountain is also known as Bald Mountain. It is perhaps one of the most popular hiking destination in the Old Forge Region. This 2-mile round-trip hike takes you to the top of Bald Mountain, with beautiful views overlooking the Fulton Chain of Lakes. A climb up the fire tower awards you with views of Blue Mountain and, on a clear day, the High Peaks. This hike starts off with a moderate incline, then ascends rather steeply with some rocky ridge walking before reaching the summit. The Beaver Lake Trail offers a pleasant hiking or biking trail that is just under 5 miles and is relatively easy. The trail is set on a dirt road along a lakeshore that was home to a private estate over 100 years ago. Beaver Lake Trail is located in Inlet; to get to the trail head, take Otter Brook Road which is off of Moose River Plains Road. Drive for about 1 mile and cross the bridge over the South Branch Moose River. Once you cross the bridge, turn right on the first side road. South Branch Moose River will meet the bridge over Otter Brook; the trail starts by crossing this bridge. Big Moose Lake offers several interesting bays, marsh areas and trails. Blue Mountain is a relatively difficult 4 mile hike with a 1,500 foot elevation gain before reaching the summit at 3,759′. There are many moderate to steep climbs on the way up that lead to beautiful views from the summit and an even better view from atop the fire tower. Blue Mountain Lake is surrounded by mountains and filled with 10 islands that are part of the forest preserve. Browns Tract Inlet is a 6 mile round trip that is well known for being a part of the 90-mile Adirondack Canoe Classic. Motor boats are not a feasible option for this route due to the many dams along the way. The surface of the river is as smooth as glass and is covered with water lilies in many areas. At just under 3 miles, you will encounter a boardwalk – the only development on Browns Tract Inlet. Buttermilk Falls has a short and quite popular trail that leads hikers to many large flat rocks that they’re able to stand on and watch the river and its waterfalls. The half-mile round trip is well worth the drive, with beautiful photo opportunities next to the roaring falls. Reach the trailhead by traveling on North Point Road in Long Lake. The beautiful walk out to Cascade Pond is about 5.6 miles with a few steep ascends and descends. This trail is considered to be of moderate difficulty.